Mohanlal is starting his next action adventure Alexander the Great from May 20 in Thiruvananthapuram. 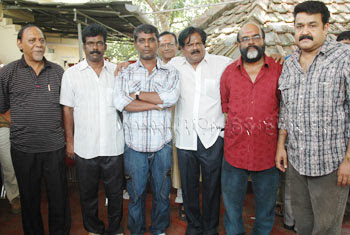 The film is produced by V.B.K Menon and directed by Murali Nagavally. Mohanlal has given 45 days call sheet for the film which is likely to be over by June end. Like the legendary warrior king Alexander, Mohanlal plays a character who is highly intelligent and conquers the business world using his smartness and brawn. In the film Mohanlal’s character name is Alexander Varma, a half Christian and half Hindu. He has terrific IQ, and wins many a battle but fate plays a cruel role. Fazil’s new discovery Aswathy Asokh is Mohanlal’s heroine in this “intelligent thriller”, whose cameraman is Subramaniapuram fame Kannan, and has music by M.G Sreekumar. The others in the cast are Innocent, Jagadish, Siddique, Ganesh Kumar, Vijayraghavan, Lakshmi and Kiron Kher.